Print / File Electronically 1099 S & Other 1099 Forms. Prints on 1099 Real Estate forms and on blank paper. Supports 1099-S, MISC, INT, R, DIV, 1098-T, 1098, 1099 A, 1099 B, 1099 C, 1099 PATR and 1099 OID Forms. Prints 1099-S Copies B and C on Blank Paper. Great for Escrow Companies, Title Companies, Real Estate Brokers, Attorneys, Banks, Accountants and CPAs. Unlimited 1099-S transferors and filers. Download - free trial. 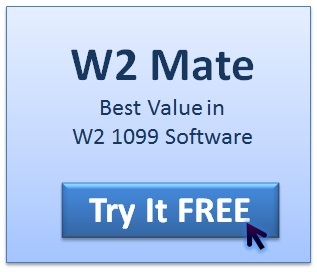 Click "Download FREE Trial"
W2 Mate is a complete W2 / 1099 processing software that supports a number of 1099 forms other than 1099 Real Estate . 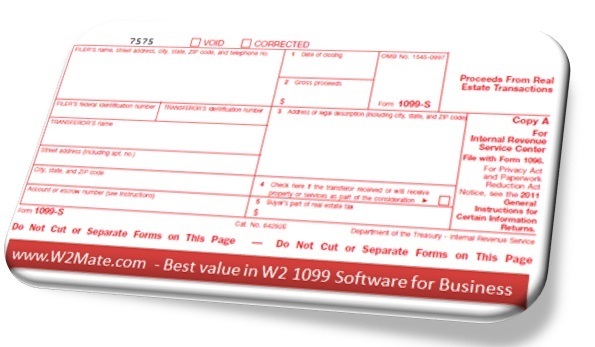 This page is dedicated to 1099-S, to read about the full capabilities and tax reporting features of W2 Mate click here . Eliminate year-end tax reporting frustrations and save crucial staff time. 1099-S Copy B (1099 Proceeds From Real Estate Transactions Copy B): For Transferor. 1099-S Copy C (1099 Proceeds From Real Estate Transactions Copy C): For Filer. All these form 1099-S copies can be printed on blank paper with black ink. Laser Copy A of form 1099 S (Proceeds From Real Estate Transactions): For Internal Revenue Service Center. Settlement agents (Real Estate Brokers, Real Estate Agents, Escrow Companies, Title Companies, Real Estate Lawyers, Attorneys for Property Transactions and Banks) are required by law to obtain the necessary information to complete and file Form 1099-S prior to the close of escrow. The Internal Revenue Code requires the seller (transferor) to provide the requested 1099-S information under penalty of perjury to the settlement agent. The IRS can charge the transferor (seller) penalties for non-compliance. 1099-S transferors (sellers), unlike other W2 and 1099 Real Estate software applications! Exports 1099S data to Microsoft Excel format.This feature is very useful to companies processing a large number of 1099-S forms. This feature is also useful to our users who import data from accounting software such as QuickBooks, Dynamics GP or Peachtree. Imports data for 1099-S forms from CSV files (requires W2 Mate Option #3). 10-99 S EFile (1099-S Electronic Filing) through IRS FIRE (requires W2 Mate Option #4). Helps filers meet IRS 1099 Real Estate reporting requirements. Upon entry of basic 10 99 S recipient information, the program automatically populates 1099-S form, with data-entry screens using form replicas. Our 1099 S program, which can be installed on local workstations or networked servers, can be used either by small businesses preparing IRS 1099S forms in-house or by tax firms managing the 1099-S compliance needs of several clients. Enter the closing date. On a Settlement Statement (under RESPA), the closing date is the settlement date. If a Settlement Statement (under RESPA) is not used, the closing date is the earlier of the date title transfers or the date the economic burdens and benefits of ownership shift to the transferee. Enter the gross proceeds from the sale or exchange of real estate. Gross proceeds means any cash received or to be received for the real property by or on behalf of the transferor, including the stated principal amount of a note payable to or for the benefit of the transferor and including a note or mortgage paid off at settlement. Enter the address of the property, including the city, state, and ZIP code. If the address does not sufficiently identify the property, also enter a legal description, such as section, lot, and block. For timber royalties, enter "Timber royalties." For lump-sum timber payments, enter "Lump-sum timber payment." If the transferor received or will receive property (other than cash and consideration treated as cash in computing gross proceeds) or services as part of the consideration for the property, enter an "X" in the checkbox in box 4. For a real estate transaction involving a residence, enter the real estate tax paid in advance that is allocable to the buyer. You do not have to report an amount as allocable to the buyer for real estate taxes paid in arrears. You may use the appropriate information included on the HUD-1, or comparable form, provided at closing. 1099 Tax S Form Who Gets What Copy? 1099-S Copy A : For Filer to file with IRS. 1099-S Copy B : For Transferor to keep for their files/records. 1099-S Copy C/State : Copy C for Filer or State Copy. Ready to print and E-file 1099 IRS S forms? Download a free demo of our 1099 S software now , enter actual recipients and see for yourself how easy and powerful this software is (make 1099 S in minutes). Although Intuit QuickBooks only supports 1099-MISC forms, our 1099-S software allows QuickBooks users import 1099 data and then map it into 1099-S forms with the ability to specify which box the money amount goes to. For example the user can remap QuickBooks 1099-MISC amounts stored under 1099-MISC Box 7 (Nonemployee compensation) into 1099-S Box 2 Gross proceeds. Once the QuickBooks data is imported as 1099-S data inside our software, the user can modify it, print it to laser 1099 S forms, print it on regular white paper or electronically file QuickBooks 1099-S with the IRS. How to print forms S 1099 using our software. 1- Install W2 Mate software. If you haven't bought our Form S 1099 Software, then you can start by downloading a FREE demo here. 5- Add your 1099 S recipients one by one (you don't need this step if you imported your 1099S data from file or from an accounting software such as QuickBooks). 6- Click on 1099 & 1098 Forms tab from the left toolbar. Under Form Type, click Select and then pick Form 1099-S from the list. 7- Now you should be inside the 1099-S screen. 8- Go through the 1099 Real Estate recipients one by one and enter the money amounts. For example fill out Box 2 Gross proceeds. Please remember to save data before you move from one Transferor to another. 9- Now to print data click on the Print button. This will bring up the Print 1099 S forms dialog. 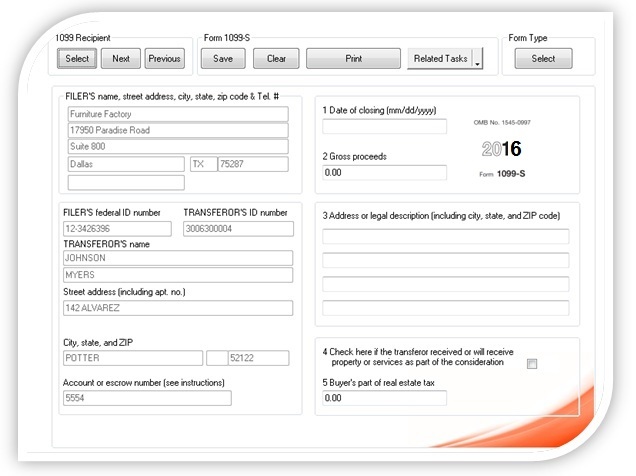 Select the transferors you want to print and the type of copy. You can print all copies on regular white paper except for "Proceeds From Real Estate Transactions Copy A For Internal Revenue Service Center", you need to print it on pre-printed forms. 10- If you are printing on pre-printed 1099 forms S then you can adjust the offset(s) until you get a perfect copy.